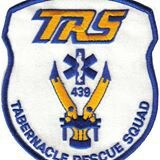 Tabernacle Rescue Squad is celebrating Celebrate National EMS Week with a Community Open House and Recruitment Night on Thursday, May 19, 6 p.m. to 9 p.m. at its station, 134 New Road in Tabernacle. Community members are invited to tour the EMS building and learn about what the rescue squad does. There will be a live vehicle extrication demonstration, on-going CPR, a rescue truck, marine boats, equipment demonstrations and more. There will also be refreshments and giveaways.